Being a Michael Caine fan carries with it many risks. The main one is that he makes any movie offered to him. He once remarked that, "I am an actor, and that's what I do. I don't write the stuff." He’s right, so I am always willing to take a chance on one of his films, hoping that it will be another gem; such as "The Man Who Would Be King", "Secondhand Lions", or this beautifully scripted film from the book of the same name by John Irving; screenplay by Peter Parnell. Although this film deals with the thorny subject of abortion, I don’t think it ever really preaches to the issue one way or another. The orphanage where Homer Wells; played by Tobey Maguire works takes in unwed mothers; offering them a choice of an abortion or giving the child up for adoption. That means that there are always children waiting to be taken away by a loving family. Homer has been at the home since he was born there, and Dr. Wilbur Larch; played by Michael Caine; has raised him almost like a son. He has even taught him obstetrics and also how to perform an abortion. Homer doesn’t have a real “problem” with the choices other people make; he just doesn’t like to perform that procedure. As a child who was given up at birth he often wonders what would have happened had his mother chose to abort him. It is the source of constant debate between Dr. Larch and Homer. The film successfully portrays all of the characters who inhabit the book by John Irving. There is Nurse Edna; played with great sympathy by Jane Alexander. She is not only a caring nurse and surrogate mother to the children in her charge, but she is also in love with Dr. Larch, although she knows that nothing will ever really become of her feelings. Dr. Larch is in love with his work, as well as the ether he inhales to help him cope with the sadness he sees all around him. When a young couple; Candy Kendall, played by Charlize Theron; and Lt. Wally Worthington, played by Paull Rudd; arrive to have an abortion, something awakens in Homer which causes him to leave with the couple on their departure. When events with the two lovers change the circumstances of their relationship Homer finds that he is confronted by love for the first time. Meantime back at Candy’s family apple orchard, its apple picking time. With nowhere else to go, Homer decides to stay on at the orchard and work with the migrant workers who pick the apples and make the cider each year. 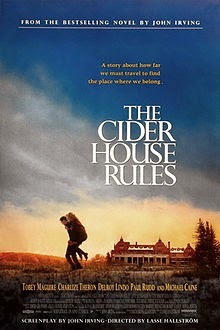 He lives in the bunkhouse; also known as the Cider House. There is a wooden sign in it that has a list of the Rules. Nobody but Homer can read, so it’s kind of silly to have them posted in the first place. The workers feel that the rules were made with no input from them, so why should they be bound by them? The Rules were made by people who never have to face their particular set of problems; making the rulers, and their rules, irrelevant. Arthur Rose; played by Delroy Lindo; has been picking apples for the Kendall’s for years. He arrives with his “crew”; including his daughter Rose Rose; played by Erykah Badu. Homer is the only white person in the bunk house, and although they are uneducated people, Homer is drawn to them. And, in turn, he is as much a mystery to them as they are to him. But Homer has a way with people; he is very much Dr. Larch’s son in many ways; and he develops an easy camaraderie with the whole crew. He is particularly drawn to Rose Rose, seeing her as a figure of tragedy and lost opportunity. And when something happens to her that causes him to use the very skills he detests righting a greater wrong, he is both shocked and enlightened by his experience. Back at the orphanage Dr. Larch finds that the board is going to replace him. He has to do something to salvage his position. This orphanage is the only family he has ever known. While Nurse Edna reads to the girls each night at bedtime, Dr. Larch does the same with the boys. He reads them exciting classic adventures and each night as he leaves the dormitory he says the same thing; "Goodnight you princes of Maine, you kings of New England!" He says this as both a blessing and a way of making them feel valued. He is deeply loved by all. Faced with the prospect of losing his orphanage Dr. Larch fakes credentials for Homer to convince the board to appoint Homer as the next director. This is not the first time Dr. Larch has falsified a document on Homer’s behalf. Unbeknownst to Homer, the heart condition he has been diagnosed with is not real, but it did keep him out of the war. In the end Homer sees things less in terms of black and white. He still doesn’t like performing abortions, but he has seen some things which change his opinion of Dr. Larch. In the end he is the one tucking the boys in at night. And as he continues to send them off to sleep with the same hopeful thought; “Goodnight you princes of Maine, you kings of New England!" he finally realizes what his coworkers at the orchard meant about the Rules. Note: They spelled Michael Caine's name wrong on the cover.